There is no point in driving more people to a website that isnt converting people to customers in the first place. 1. 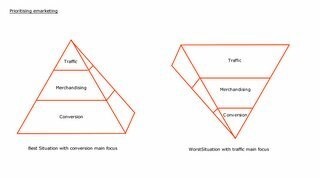 Conversion – Get your website converting traffic into customers. Measure this with statistics. How many people visit your website versus how many people convert into customers is one of the simplest measures. 2. Merchandise – Package up your products to be more appealing to buy. Now that you have your site converting get your customers to buy more products per basket, cross sell, upsell, package products, bundle them and give specials, competitions, promotions. 3. Traffic – Increase it, since you know your website converts bolster it with a mountain of targetted traffic. Easiest and fastest way to do that is buy more keywords. Email market to current customers, offer incentives for referrals, run affiliate programs, content share, banner advertise and build traffic. Advertising in other mediums also boasts online traffic. This order is critical. The worst thing you can do is send more people to a website that doesnt convert. Its like pouring money into a leaky funnel! Convert, merchandise, traffic – monitor this continually, one break in the funnel can disturb the whole process.